HARBEC cares about the environment and it’s reflected in everything we do. By combining energy efficient equipment with on-site green energy sources, we reduce our greenhouse gas (GHG) emissions, minimize our carbon footprint and lower our environmental impact on our natural resources such as water, land and air. We foster a mentality of sustainability that permeates our corporate culture. With any project or new initiative, our employees ask themselves, “How does this impact the environment?” As a team, we have a proactive awareness, and personal responsibility, for protecting the environment. As a result, we have developed many ingenious solutions to conserving water, reusing scrap, and eliminating pollutants. Over the past few decades, we have taken many strides to evolve into one of the most environmentally friendly manufacturing firms—not only in the country but worldwide. As every member of HARBEC agrees, we will meet today’s needs without compromising those of future generations. And we invest responsibly to stand behind this commitment—because we take the welfare of our global community seriously. HARBEC is a U.S. DOE Better Plants Challenge Partner. HARBEC has established a goal to reduce its plant energy intensity 25% by 2021 (from a 2010 baseline). In addition to the reduced noise levels, HARBEC’s transition from hydraulic molding machines to all-electric presses has lowered energy costs up to 50% and has increased processing speed and cycle time. Where we used to produce buckets of start-up parts to achieve process accuracy, repeatability and predictability, we can now get there in only a few parts. And we don’t waste energy in the process. Super, ultra-low emissions are our “driving” force—pun intended. Our company-owned vehicles include hybrids, all electric (with zero emissions), and those that run on bio-diesel. Our bio-diesel delivery truck alone reduces emissions by 50-90% over regular diesel. HARBEC has a hybrid diesel truck along with 1 Toyota Prius and 1 Hyundai Ioniq hybrid vehicles that run on gas but, with battery assist, the fuel consumption is very efficient (45-55 mpg) and they produce one-tenth the emissions of an equal sized standard gas vehicle. In 2002, HARBEC installed a wind turbine to provide a clean, sustainable and renewable energy source: wind (which, in Upstate NY, is in abundant supply). In 2010, HARBEC installed a second (850 kW) wind turbine. Combined, these enable HARBEC to produce about 60% of its current electrical needs from a renewable energy source. 100% of the electricity HARBEC purchases from the utility is green power. We are proud to be US EPA Green Power Partners. At the heart of HARBEC is one key question that should be posed to all manufacturers: Why use metals when you don’t have to? If you haven’t converted to plastic yet, please speak to us. We can help. Recently HARBEC completed a second total building lighting system upgrade converting 1,000 high-efficiency bulbs to LED which will reduce the amount of energy used by 45%. This means half as much greenhouse gas is generated while our bill is reduced proportionally. 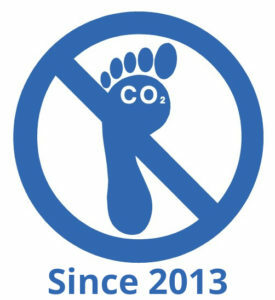 We can lower the CO2 emissions we are responsible for by doing things like driving less, recycling, using renewable energy, and buying products like LED bulbs. However, it is virtually impossible to reduce our CO2 output to 0. That’s where “carbon offsetting” comes in. Offsetting allows an individual, business, or organization to lower CO2 emissions in another location by an amount equivalent to those in which we create. How is this possible? Organizations sell carbon offsets and use the proceeds to support high-quality renewable energy, energy efficiency, and reforestation projects, which all result in lowering CO2 emissions in other locations. Carbon offsetting is the act of mitigating (“offsetting”) greenhouse gas emissions. HARBEC uses Compressed Natural Gas (CNG) to run its 18 Capstone microturbine generators which produce the electricity used to operate our molding company. The hot exhaust from these microturbines is directed to a heat exchanger which, in turn, transfers the heat to water. The hot water is then used to heat the building through radiant in-floor heating systems and pre-existing forced air systems. During the summer, the hot water is sent to an absorptive chiller, which uses heat to create cold water for air-conditioning. HARBEC’s co-generation operation produces less than 10% of the CO2 emissions that the most efficient oil or coal burning utilities produce to manufacture the same amount of energy. Heat and Air Conditioning are free by-products of the process. HARBEC saves over one million gallons of water per year by utilizing an 800K gallon reservoir to capture and hold rainwater. This system uses thermal mass to temper heated process wastewater, (i.e., dissipate the heat) prior to sending it to our cooling tower, which reduces the energy required for total cooling requirements. Currently, a project is underway to control and condition the stormwater from the buildings and parking areas. This water is collected in a pond, which will then provide a source for the evaporative cooling system make-up water, fire sprinkler system, and employee enjoyment. We became Water Neutral in 2015. HARBEC developed a unique jack-shaped product made of scrap plastic materials that have twice the surface area and twice the voids of dolomite. While HARBEC employs a typical cattail filtration system to remediate parking lot runoff (i.e., pollutants such as salt and oil), the cattail roots, and associated, microorganisms live in the vast surface areas and voids of the Ecostones, instead of soil. The efficiency of these HARBEC Ecostones has been proven by A/B tests of side-by-side dolomite vs. Ecostone for water purification in ponds. HARBEC strives to assemble products for firms who are interested in reusable packaging to minimize landfill waste. Consistent with HARBEC’s environmental policies, we all benefit when quality corrugated materials are reused and retired only when the cardboard is exhausted. HARBEC is extremely proud to have received the 2011 “MEP Excellence in Sustainability Award” from NIST, the National Institute of Standards and Technology, at their annual Manufacturing Innovations Conference in Orlando, Florida. The Excellence in Sustainability Award recognizes and celebrates manufacturers whose outstanding development and implementation of green/sustainable practices have contributed significantly to their business results, workplace and community. The award supports the MEP (Manufacturing Extension Partnership) mission in strengthening the systems and processes of U.S. manufacturers to make them more profitable and competitive. Almost a decade ago, HARBEC was one of 17 businesses, across the USA, to receive the EPA’s 2002 Energy Star Small Business Award. ENERGY STAR salutes the small businesses across the country that practice exemplary energy efficiency which translates into real dollar savings and prevents pollution. HARBEC recently completed building a “green” warehouse at its manufacturing facility, following the guidelines provided by LEED™ for sustainable building and architecture. The structure has two times the insulation required by building codes and the exhaust of the micro-turbines supplies the radiant heat in the floor. Green building practices offer an opportunity to create environmentally sound and resource-efficient buildings by using an integrated approach to design. Green buildings promote resource conservation, including energy efficiency, renewable energy, and water conservation features; consider environmental impacts and waste minimization; create a healthy and comfortable environment; reduce operation and maintenance costs; and address issues such as historical preservation, access to public transportation and other community infrastructure systems. The entire life cycle of the building and its components are considered, as well as the economic and environmental impact and performance. 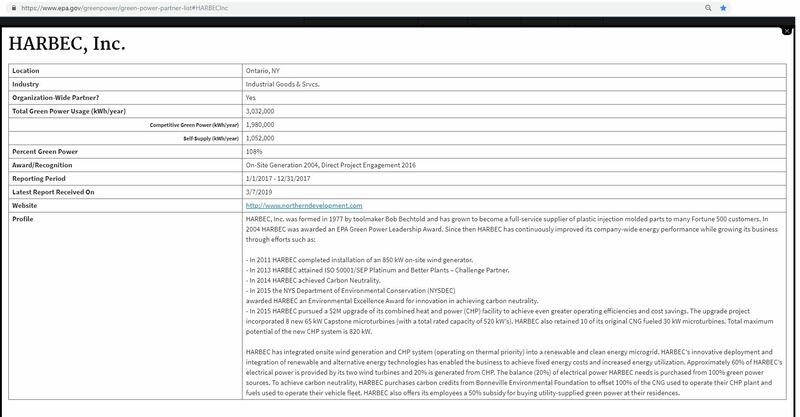 HARBEC has demonstrated innovation in the selection and integration of unique partners to help fulfill its ongoing pursuit of energy and environmental excellence. In the many years HARBEC has worked with the US Department of Energy (DOE), New York State Energy Research and Development Authority (NYSERDA), Enerit, DEKRA, and others to help achieve its goals. By collaborating with public-and-private organizations HARBEC has been able to align the right interests that could collaborate on the complex task of carbon accounting and neutrality. The partnerships with these organizations have led to constructive solutions for measuring, monitoring, and understanding energy use within manufacturing environments and establishing processes, tools, and solutions to manage and reduce manufacturing energy use.